“We back / Reunite like The Wu.” This lyric, slotted into the middle of “Wu Massacre’s” first single, “Our Dreams,” sets the tone for this release by three of the Wu Tang Clan’s most well-known members: Method Man, Ghostface Killah, and Raekwon. However, this is no mere return to the 1990s Wu formula of steady beats and stripped down samples overlaid with brutally compelling raps. Instead the album represents a boldly dynamic approach to hip-hop. “Our Dreams,” an at times hazy romantic rap ode featuring sampled vocals from Michael Jackson’s “We’re Almost There,” illustrates this musical progression perfectly, displaying a subtlety and refinement that distinguishes “Wu Massacre” from the mass of hip-hop currently circulating. The album still includes the typical clichés of misogyny, shameless bravado, and violent fantasy—it wouldn’t be a Wu release if it didn’t—but it manages to quite successfully navigate the fine line between aggressive and elegant. This culminates in a soulful, uplifting and rather smooth production that still manages to pack a brutal, knuckle-duster-wearing punch. Quite simply, “Wu Massacre” manages to condense all that is most vitally raw and dynamic about this hip-hop trio into a snappy 30-minute album that blazes by in a flash of intensity and verve. The album bristles with intriguing musical touches. Opener “Criminology 2.5,” for instance, features a chorus heralded by resounding trumpet samples, soulful female vocals and trickling piano flourishes. This track propelled further forward by a punchy yet grooved drumbeat and the consistent lyrical vigor of Meth, Ghost, and Rae. In this manner, the majority of the album’s tracks seem similarly polished and ebullient, with a steady resolve and undeniable infectiousness. Unfortunately, “Wu Massacre” as a whole lacks a sense of integration. It appears that almost no attention was paid to the track sequencing, and the songs proceed in a decidedly clunky manner. This is illustrative perhaps of a lack of attention to the overall feel of the album, which ends up seeming like a collection of great songs pushed thoughtlessly together. There is also perhaps a certain hastiness in the way in which “Wu Massacre” has been pushed out for public consumption. The last two songs clearly serve as appalling filler, and “Criminology 2.5” even features re-used Ghostface Killah raps rather than new material. Additionally, the album’s skits, such as the “How to Pay Rent Skit” featuring Tracy Morgan, are seemingly intended to be ironic interludes but end up as inane interruptions. Drafting in a large group of hip hop production may have helped to produce much of the quality seen on each song. However, the general lack of attention to detail ultimately prevents “Wu Massacre” from being the incredible album it could and should be, rather than merely an impressive collection of songs. 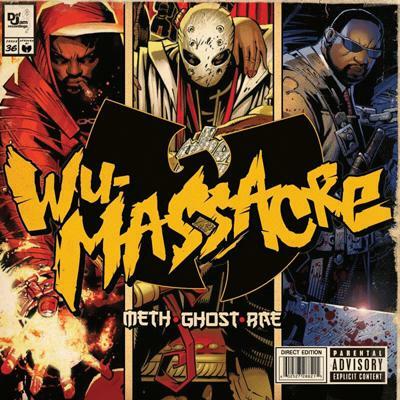 These issues aside, the dominance and individual capabilities of each of these three artists is indisputable, and each of them is on top of their game on “Wu Massacre.” It is in a sense fitting that Marvel Comics artist Chris Bachalo designed the album cover for “Wu Massacre”, as it demonstrates perfectly the trio’s status as de facto superheroes in the world of hip-hop. Most importantly, it seems like they have managed to successfully fuse each of their three highly successful musical visions and their most irresistible elements. Combining the expert sampling of recent Ghostface Killah releases such as “Fishscale,” the classic vicious rap bite of Method Man, and the slick production skills and entrancing vocals of Raekwon, “Wu Massacre” delivers a hearty slice of outstanding rap. This release should leave members of the Wu Army suitably impressed, and shows that the spirit of its members is still as strong as ever.